I got 2 currently selling each for $80. 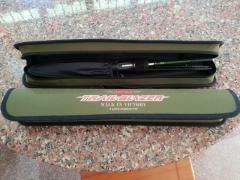 The Rapala Trail Blazer 4-piece travel spinning rod is designed for the travelling angler. Built using a high-modulus, Japan-made prepreg graphite blank, this series offers both a light version and a medium-heavy model to suit most luring applications. Precision manufacturing with quality materials minimize flat spots commonly found in multi-piece travel rod joints, resulting in a smooth rod curvature when loaded. The Trail Blazer features Fuji VSS / ECS reel seats and Fuji Alconite K-guides with a travel rod case as standard issue.